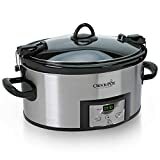 It might seem odd to describe a kitchen gadget as “transformative,” but that’s the only word I can think to use when describing the Crock-Pot 6-Quart Programmable Cook & Carry Slow Cooker. If you already have a multi-use slow cooker like this one, then you know exactly what I’m talking about. If you don’t, then you need to order this model immediately while it’s still discounted on Amazon. Honestly, I am actually disappointed and saddened these days when I cook a meal that doesn’t involved this Crock-Pot. That’s how much I love it.